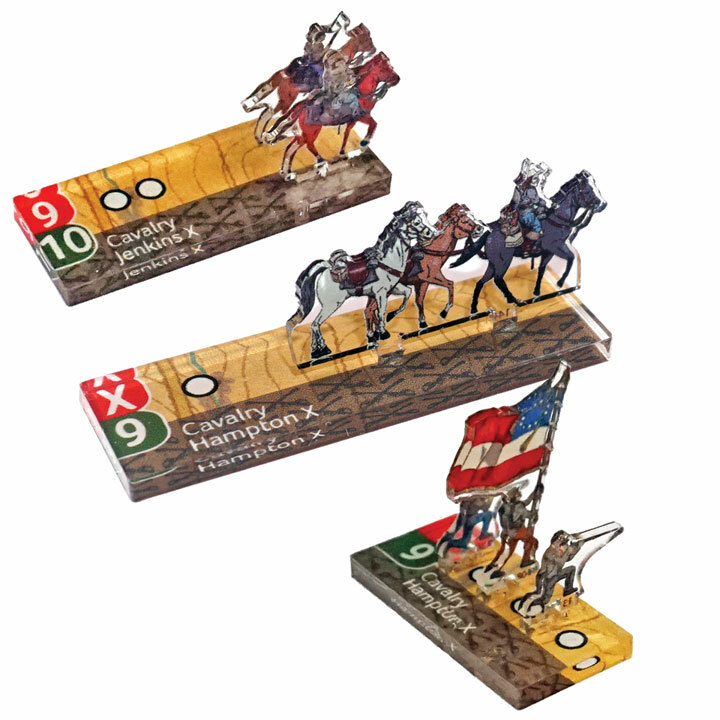 Standees in Rally Round the Flag® - Division Command represent the Infantry, Artillery, Cavalry and Leaders of each army. 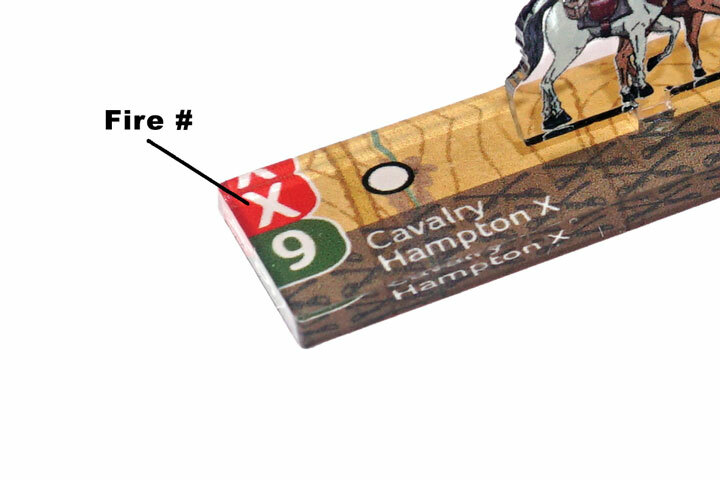 Each of the Infantry, Artillery and Cavalry standees have Fire factor numbers (White number surrounded by Red on top), Military Discipline factor numbers (White number surrounded by Green on bottom), and Unit Strength (Each White Circle outlined in Black). Each Leader has three values, the Command Number (Red number), the Leadership Number (White Number) and Heroism (Green Number). 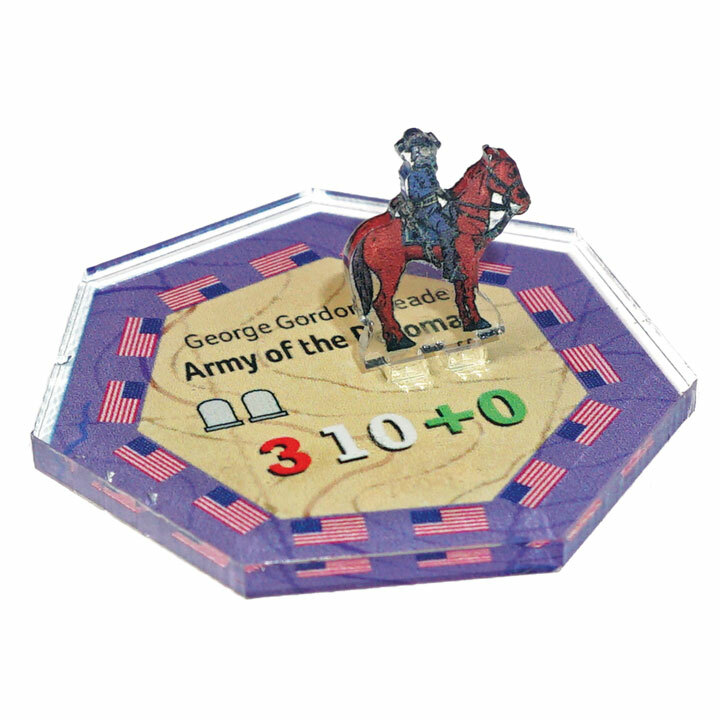 In Rally Round the Flag® - Division Command each Infantry stand represents a Brigade of troops. Each Unit Strength symbolizes approximately 300 combat ready troops. Each Infantry Unit is tied to a specific Corps, which can be determined by the background used in the name of the unit. (In this case 1st Brigade of 3rd Division, Union 5th Corps). 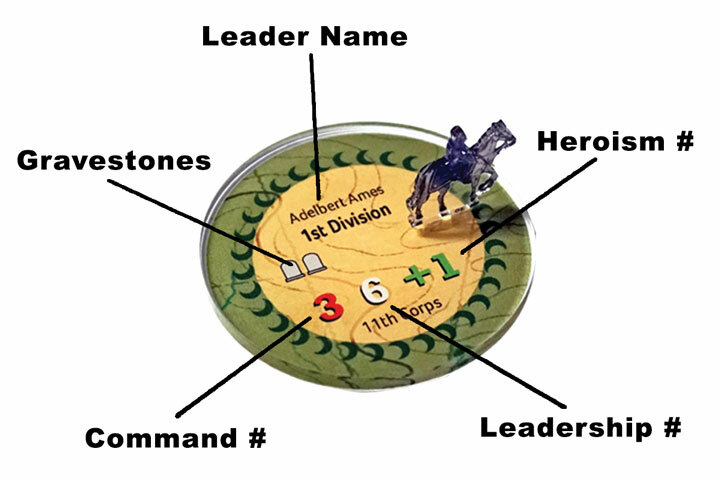 Infantry units are activated to move, fire and attack by using Action Points during the turn. 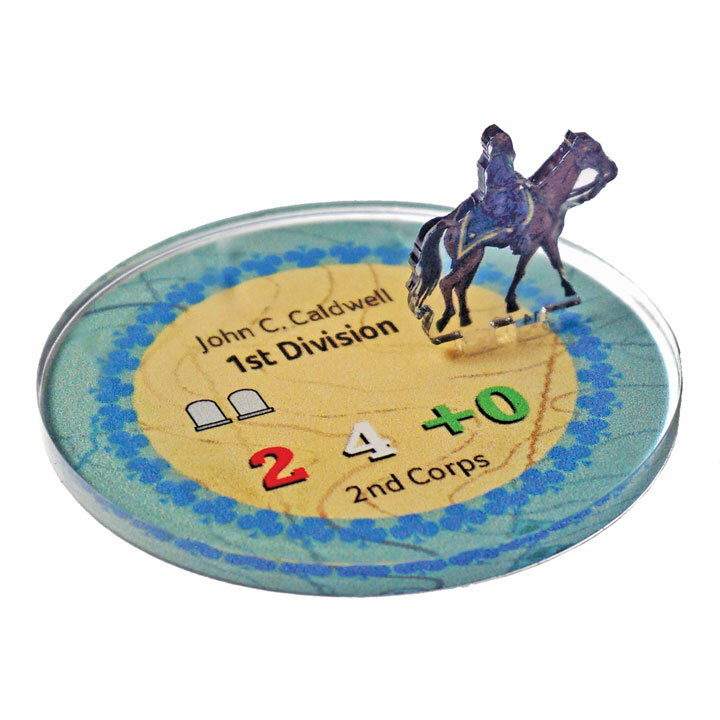 In Rally Round the Flag® - Division Command each Cavalry stand represents a Brigade of Cavalry. Each Unit Strength symbolizes approximately 300 combat ready troops. 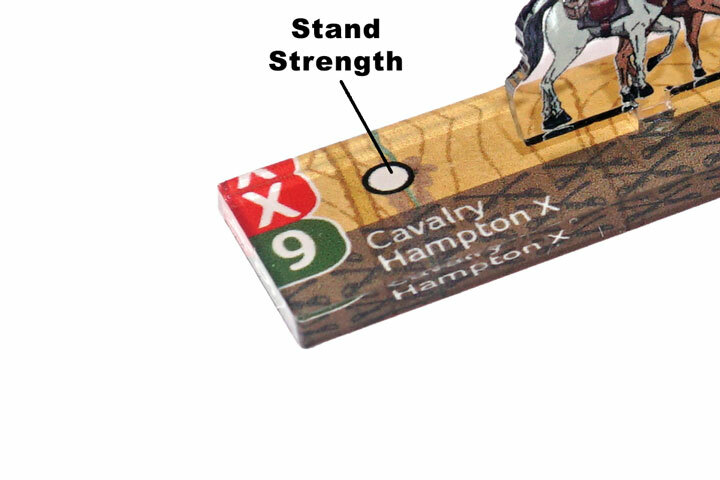 Each Cavalry Unit comes with three stands. 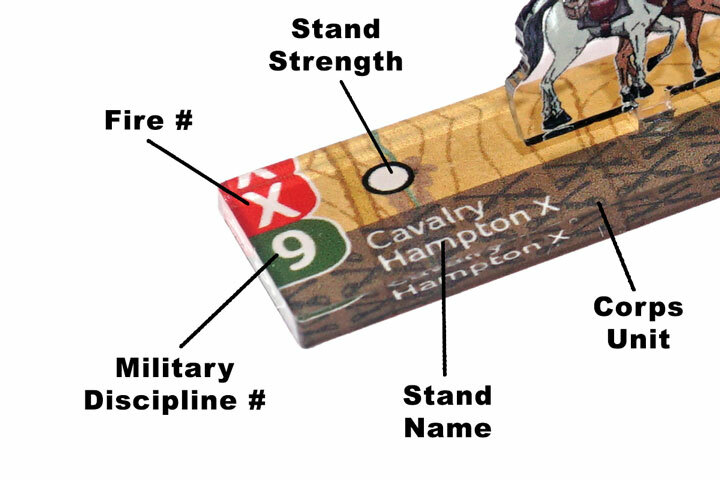 One stand is used for when the Cavalry is mounted, and two stands are used to show the Cavalry dismounted with Horseholders standing by with the horses ready for quick mounting. 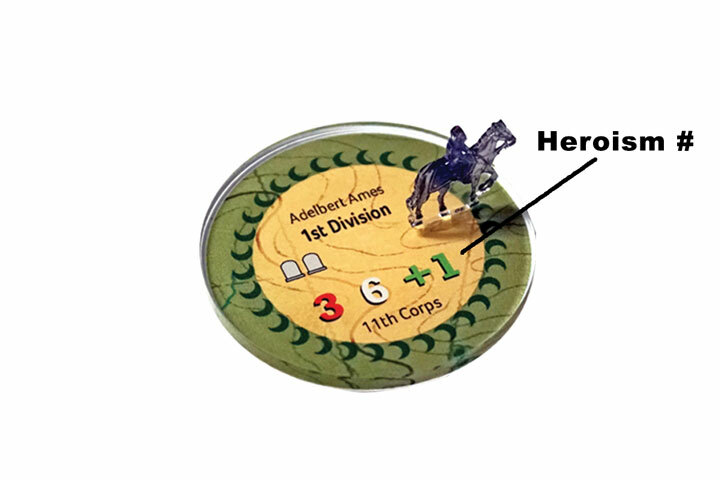 Cavalry units are activated to move, fire and attack by using Action Points during the turn. 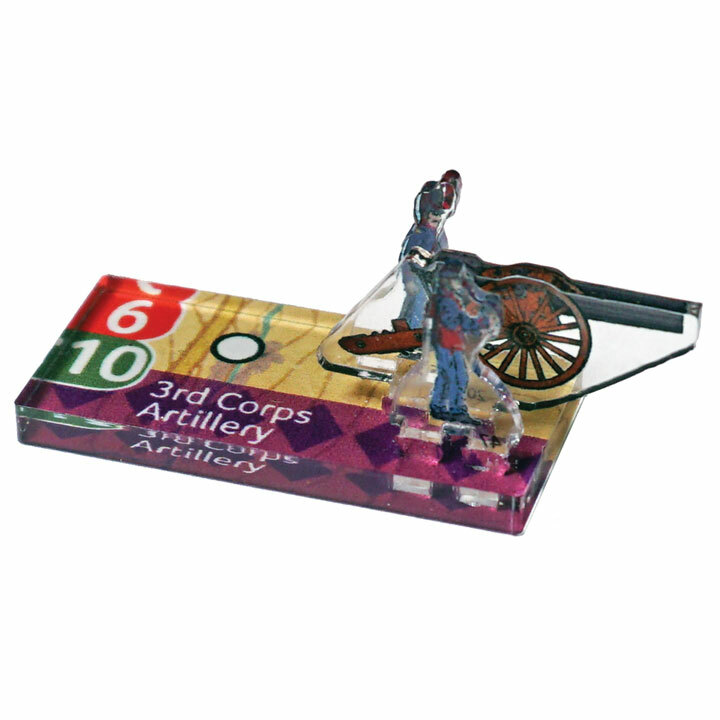 In Rally Round the Flag® - Division Command each Artillery stand represents a Divisions or Corps battery of guns. Each Unit Strength symbolizes approximately 24 guns. Each Artillery Unit is tied to a specific Corps (and for the Confederates, a specific Division), which can be determined by the background used in the name of the unit. (In this case 3rd Corps Artillery in Union 3rd Corps). Due to organizational differences, the Confederates had dedicated batteries of guns that were under the command of each Division Leader with another set of batteries reserved for the Corps Leader. The Union Army, instead had all their guns under the direct command of the Corps Leader. 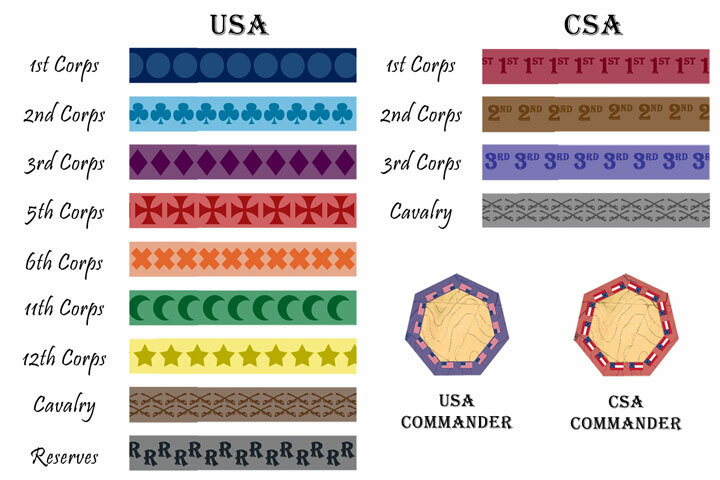 In Rally Round the Flag® - Division Command each Leader stand represents either the Army Commander or a Corps or Division Leader. The Command Number (Red number) represents the number of cards the Leader draws when activated during the turn. The Leadership Number (White Number) is the number of Action Points the Leader is granted when activated. Action Points are used to move, fire and attack with troops. The Heroism Number is the modifier to all Military Discipline checks suffered by troops in the same area as the Leader. The Gravestones are used to mark instances where the Leader has been either wounded or killed and a subordinate leader is required to step up and take command. Leaders may only activate units that are under their command. 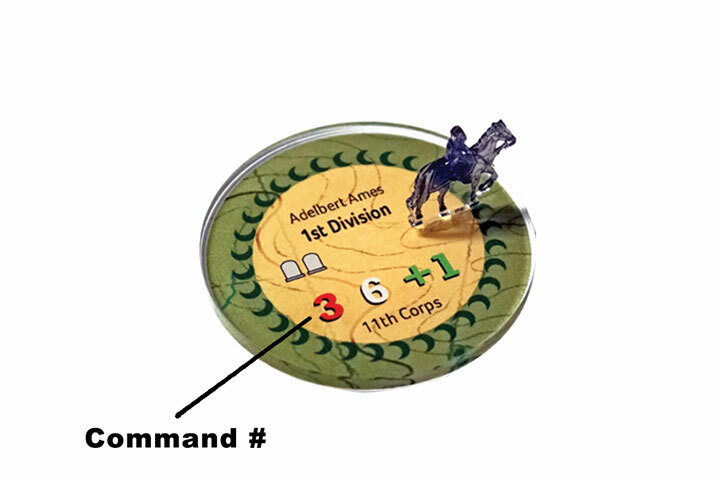 There is one overall Commander for each Army in Rally Round the Flag® - Division Command. These stands represent either General Robert E. Lee or Major General George Meade. Commanders act exactly like Corps Leaders with the exception that they can activate any unit in the Army and are not limited to a single Corps. The Fire number is a white number in a red circle that reflects the units drill, marksmanship, and equipped weapons. The Military Discipline is a white number in a green circle that reflects the élan, experience and leadership of the unit. Each stand has the name of the unit written next to the Fire and Military Discipline numbers, written over top of the Corps designation. Troop Strength is measured in steps depicted by the standees on a stand. A stand that contains 4 rifleman and a flag bearer counts as having a strength of 5. As the stand takes hits, the base is marked to record the loss. Troop Strength is measured as the standees minus and marked losses. The same 5 strength base that has 2 marked losses has a strength of 3. Each leader's name is located at the top of the base, along with the Army or Corps that they command. Generals that are killed or wounded have their base marked on the Gravestone. Command and Leadership values on the General are -1, and heroism is increased by +1 for each Gravestone marked on the base. 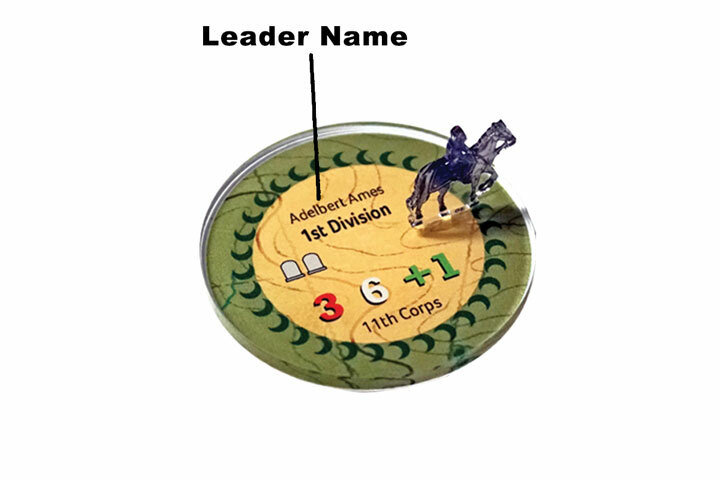 A General has a command number in red on the base of the general. The command number is the number of cards drawn when activated. The command number is reduced by 1 for each Gravestone marked on the Leader. 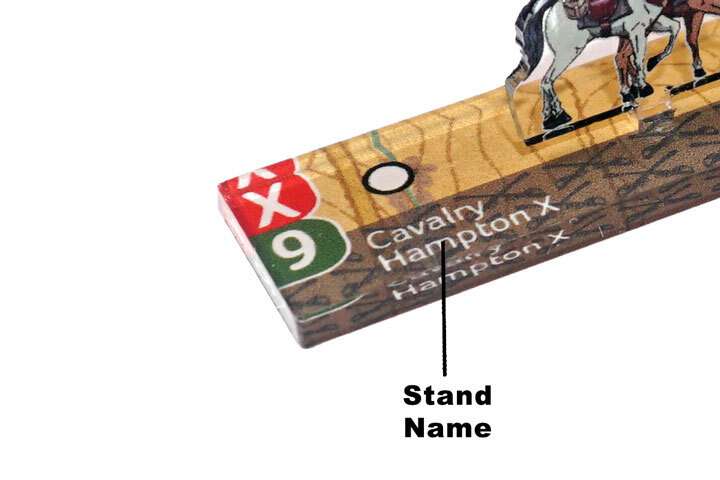 A General has a leadership number in white on the base of the general’s stand. This is used as your hand capacity if he is your commanding General. 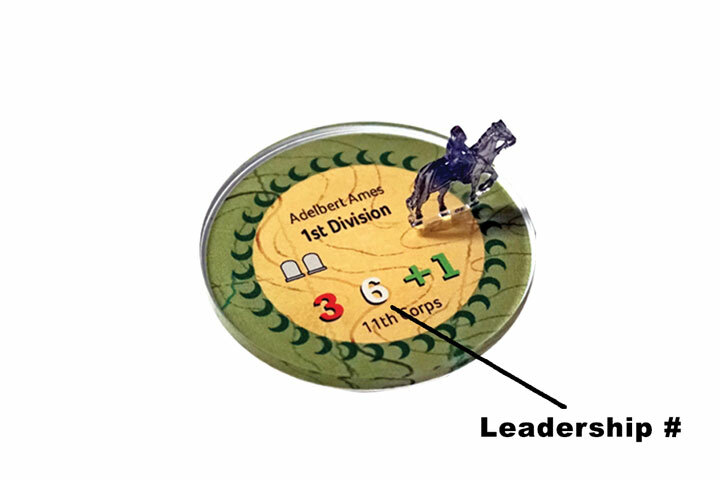 When the general is activated, the action points marker is set to the value of the leadership number. Also, an activated general is the center of command. All action points spent count outward from the active general. A General has a heroism number as a green number with a + included. 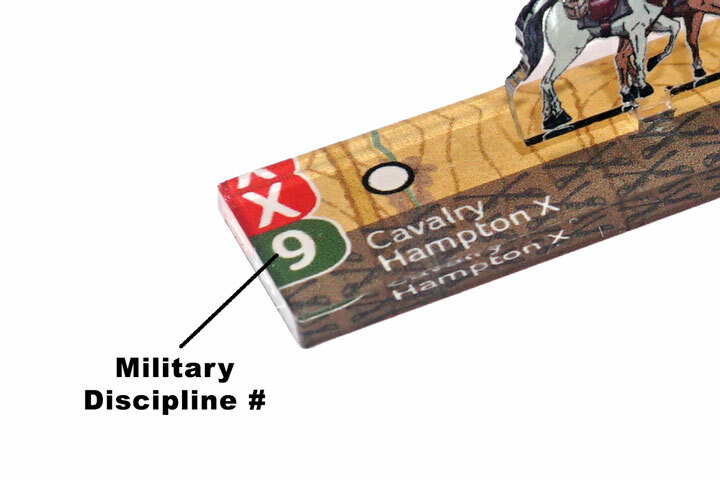 When the general is in a column on a battle board, or in an area on the map, the heroism number modifies die rolls for battle, fire or military discipline checks. 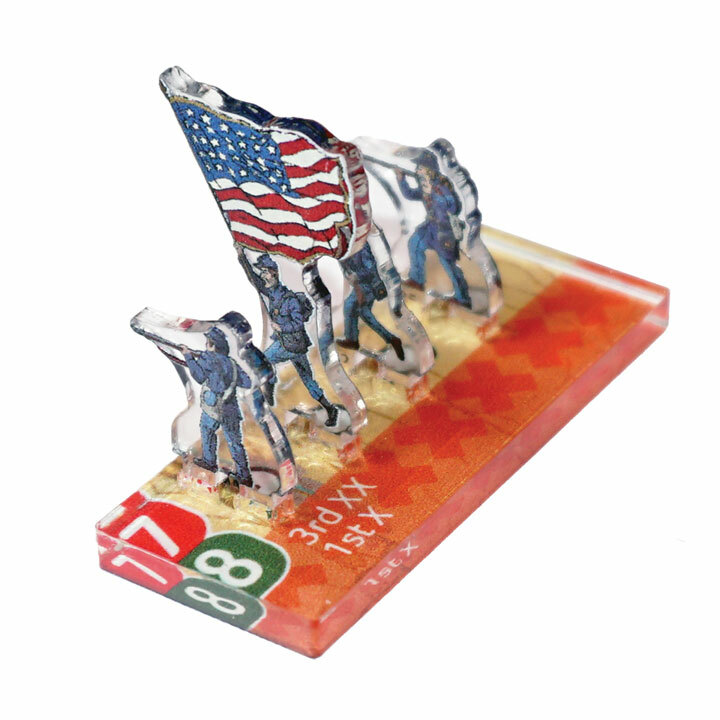 Rally Round the Flag® uses troop pieces to represent the armies in the Battle of Gettysburg during the American Civil War. Each troop is comprised of an acrylic base and a number of standees which represent the size of each unit. Before starting, lay your base face up. Then, organize your standees in front of your bases. This will make assembly fast and easy. The number on the bottom of the standee should match the number on the bottom of the base next to the holes that the standee should be inserted into. To insert the standee, line up the two prongs on the bottom of the standee and carefully press straight down until the standee “snaps” into the base. Standees and bases are meant to snap into place. Glue can damage acrylic. Make sure the standee is facing the correct direction when being inserted. The standee should always face to the outside edge of the base. PRO TIP: Insert all shorter standees into base first, then insert the flag carrier. Flag carriers are taller and can interfere with the insertion of shorter standees. The shape of the base and placement of the standee piece will vary according to the rank or type of troop. 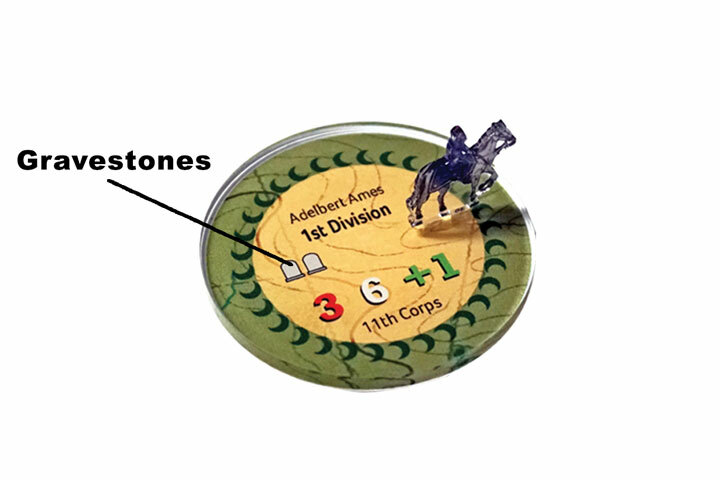 Leader bases may be different shapes and sizes, but the soldier piece is still inserted facing the edge of the base. Cavalry and artillery standees will be inserted facing the side of the base, but will face forward when entering the battle. PRO TIP: Insert cannon pieces into base first, then insert the soldiers. Cannons are larger and are placed between the soldiers.